Here’s a look at my completed projects over the past few years, along with some real oldies. 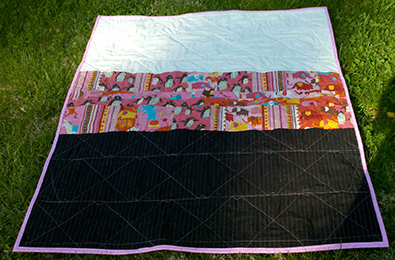 Modern Lily Pad Quilt tutorial, June 2015. Kind of improv, but quick and easy. The Atomic Apps quilt, finished July 2014. Table runner. Finished January 2014. Flannel quilt made for charity. Finished September 2013. “The Luck of the Irish,” finished May 2013. Given to a survivor of the Oklahoma tornadoes. 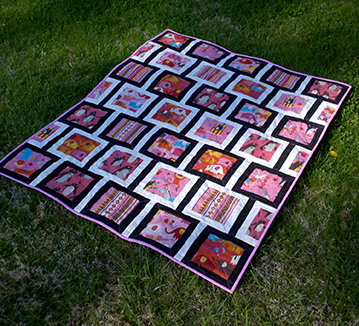 A quilt for baby Ella, using “Chain Linked” by Amy Smart. Fabric: “Circus” by Nancy Wolff for Kokka Japan. Finished April 2013. Back view. My idea was to make it like a white blouse, with a cool belt and black skirt, in anticipation of whatever career she chooses someday. “Mariner’s Sky,” finished March 2005. “Mom’s Christmas sampler,” my first quilt. Finished December 2004. I love your quilts, especially a Quilt for Baby Ella and Mariner’s Sky. I need t get busy! Thank you so much, Vickie. They were a lot of fun to make! I like the large Christmas quilt. It makes me want to make one. Nice group of quilts. Thanks, it’s actually the first one I ever made, and it’s still my favorite, too. I hope to finish my WIP quilts this year, and am trying not to start anything new until I do.